The Technicolor 3 filter is a color filter that emulates the movie industry's Technicolor film processing technique. It gives your photograph a colorful look similar to old movies with color. Click on "Technicolor 3 Color". The following is a photograph, taken at the Hyatt Regency Hotel in San Francisco, before applying Technicolor 3 filter. Using the default Technicolor 3 settings of Gimp renders the following photograph. 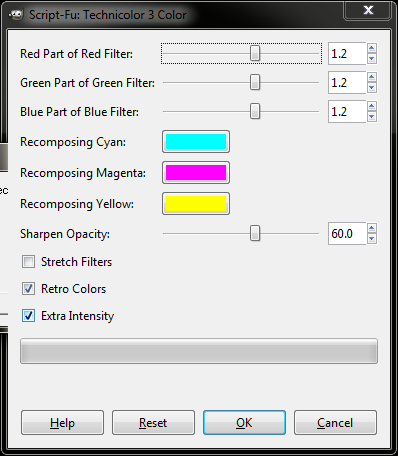 The following screen shot shows the default Technicolor 3 settings to produce the example picture shown above. Download the original photograph above. Try different Technicolor 3 settings on the original photograph. Come up with an interesting example? Share (by attaching) the example photograph and a screen shot of the Technicolor 3 setting you used.